Members of the Westboro church, based in Topeka, frequently protest at funerals of soldiers with signs containing messages such as "Thank God for dead soldiers"
The controversial Rev. 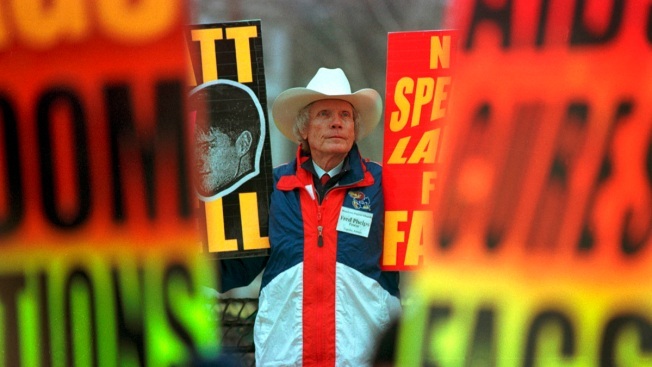 Fred Phelps Sr. is best known for founding the Westboro Baptist Church, which is widely known for its protests at military funerals and for its anti-gay sentiments. Phelps has been moved into a Shawnee County care facility in Kansas. The Rev. Fred Phelps Sr., who founded a Kansas church widely known for its protests at military funerals and anti-gay sentiments, is in a care facility, according to a church spokesman. Phelps, 84, is being cared for in a Shawnee County facility, Westboro Baptist Church spokesman Steve Drain said Sunday. Drain wouldn't identify the facility. "I can tell you that Fred Phelps is having some health problems," Drain said. "He's an old man, and old people get health problems." Members of the Westboro church, based in Topeka, frequently protest at funerals of soldiers with signs containing messages such as "Thank God for dead soldiers," and "Thank God for 9/11," claiming the deaths are God's punishment for American immorality and tolerance of homosexuality and abortion. Westboro Baptist, a small group made mostly of Phelps' extended family, inspired a federal law and laws in numerous states limiting picketing at funerals. But in a major free-speech ruling in 2011, the U.S. Supreme Court held that the church and its members couldn't be sued for monetary damages for inflicting pain on grieving families under the First Amendment. The Southern Poverty Law Center, a civil-rights nonprofit group, has called Westboro Baptist Church a hate group. Nate Phelps, an estranged son of Fred Phelps, also said in an email to The Topeka Capital-Journal that members of Westboro have voted Fred Phelps out of the church. Nate Phelps, who broke away from the church 37 years ago, told the newspaper that church members became concerned after the vote that his father might harm himself and moved him out of the church, where he and his wife had lived for years. Fred Phelps was moved into a house, where he "basically stopped eating and drinking," Nate Phelps said. Drain declined comment Sunday on whether Fred Phelps had been voted out of the church. Drain said Westboro Baptist Church doesn't have a designated leader. "We don't discuss our internal church dealings with anybody," Drain told the newspaper. A Kansas gay rights group on Sunday urged the gay community to respect the privacy of the "notoriously anti-LGBT" pastor if his health is declining. Phelps and the members of his church have "harassed" the grieving families of lesbian, gay, bisexual and transgender Kansans and others, Thomas Witt, executive director of Equality Kansas, said in a prepared statement. But Witt added: "This is our moment as a community to rise above the sorrow, anger, and strife he sowed, and to show the world we are caring and compassionate people who respect the privacy and dignity of all."